If you know someone who crafts then you might be wondering about some of the best gifts for crocheters. After all, they are always offering you something handmade, and you want to be able to return the favor with a present that really inspires them. This list was compiled with help from crochet enthusiasts all around the world, who were invited to take a poll and comment on what they'd like to receive as a gift. Straight from the horse's mouth, this list of gift ideas is perfect for anyone in your life who enjoys yarn crafting. Keep it handy for every birthday, Christmas and "just because" occasion. New crochet pattern books are always a good choice because the recipient probably doesn't have them, yet. A subscription to a crochet magazine will allow your gift recipient to keep receiving crochet patterns all throughout the year. If you know the types of crochet patterns that your loved one enjoys then you can purchase a set of PDF downloads through Ravelry, Etsy or Craftsy. Luxury and novelty yarns - cashmere, alpaca, silk blends - would be appreciated by most crocheters. Many will not splurge on this type of yarn for themselves but enjoy crocheting with it. If they frequently make items for the kitchen, a quality cotton yarn is sure to be appreciated. Acrylic is one of the most popular fibers for crochet, and it is often one of the most affordable. If you wish to buy a big lot of yarn to inspire a crafter then this might be a nice choice. Recycled yarn, such as silk sari yarn, is a green alternative if you want to get a gift for a crocheter who is eco-conscious. Crochet thread is a fabulous gift idea, but only if you know the recipient likes working with it and will be able to use it. Crochet thread tends to be more challenging to work with than yarn is. If you haven't ever seen the intended recipient crocheting these types of items, chances are that they would prefer yarn to thread. Skip buying the cheapies and go for high-quality hooks. According to the poll, "better-than-basic" hooks were a much more popular choice than basic hooks were. Handmade crochet hooks also make nice gifts. These can be made from a range of materials including wood, plastic, glass and polymer clay (around the handle). Get a set of crochet hooks rather than just one or two. Unless you know the crocheter well, it would be hard to guess which sizes they prefer, so hedge your bets and get a range of them. If you know someone who collects crochet hooks then you might take the time to find a set of vintage crochet hooks to add to that collection. A "crochet kit" is a grouping of crochet-related items that are packaged and/or sold together. 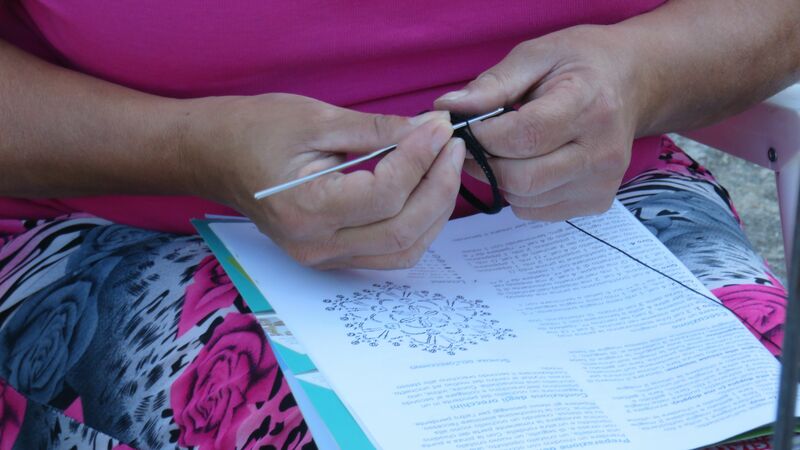 You can also create your own crochet kit using items the recipient could use together. The main purpose of a crochet kit is to help to make it easier for the recipient to get started with either the craft in general or with a specific project. Some crochet kits, intended for beginners, are packages of crochet hooks and small bits of material. Beginner kits often include "how to" instructions. These make great gifts for people who are just getting into the craft or who are returning to it after a long time away. Other crochet kits include a pattern plus all the yarn you'd need to complete a project, and may or may not include crochet hooks. This type of kit is an outstanding gift for the advanced crafter. It combines the two most-requested items crocheters want (a pattern and yarn) and allows the recipient to get started on the project immediately. If you don't want to risk the chance of buying the wrong crochet supplies for someone else then consider getting a hook case instead. There are a wide variety of different organizers available that people can use to store the crochet hooks they already own. If the recipient likes both crochet and knitting, look for an organizer that can accommodate knitting needles as well as crochet hooks. Even if the recipient does not knit, they might still like a larger organizer if they have a lot of large tools, for example, hairpin lace forks, afghan hooks, circular hooks, etc. On the other hand, if you have a crafter who travels frequently and likes to take crochet on the go, you might want to look at a compact organizer that can easily be tossed into a suitcase or purse. A significant number of poll respondents commented that a gift card was the gift they wanted most. This, of course, allows the crocheter to buy what they really want. With crafting, part of the joy is planning a project, so a gift card does really add to the experience and isn't at all impersonal.